Squeaky Books: Utah Author Month! Yay! May is the official(?) Utah Author Month! You can read more about the details here at Maw Books Blog, but in a nutshell: it's a celebration of Utah authors! I adore Utah authors, so you totally know I'm participating. Wondering who's a Utah author? Well, I compiled a short list of just some of Utah's awesome authors. I'm going to read the Princess books by Mettie Ivie Harrison, The Princess of the Midnight Ball by Jessica Day George, The Hourglass Door by Lisa Mangum, Posession by Elana Johnson, and I'm going to start re-reading the Bayern books and Book of a Thousand Days. 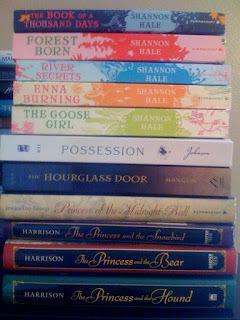 I doubt I'll read all five Shan-books this month. But we'll see. Even if you don't live in Utah, I would really encourage you to participate! If there are any books written by the authors listed above that you're dying to read, go for it! And claim it's for Utah author month! Win-win! Brandon Sanderson's Alcatraz series (junior fiction) is a lot of fun too. There are four of five published so far. Wow. I already have a lot of these! I didn't realize the connection. I love so many of these books :) What edition are the Books of Bayern that you have? They're so beautiful! Oh! I didn't realize that a few of these books were out already. Thanks. They're the UK editions. SO PRETTY! And most of them are out. Except for POSESSION, I think.